Dhanno was an angry young buffalo. He got angry over small matters and when he did he would ruin everyone’s day. He would break things, throw buckets filled with water, and run after small animals and scare them. No one wanted to be Dhanno’s friend because of his anger. Except Bholi, the cow. Bholi was his best friend. She was the opposite of Dhanno, always quiet and doing her own work. She would always be calm and forgiving. One day Bholi was grazing grass in the morning as usual. Dhanno came and stood beside her. She knew he was angry for some reason. She waited patiently till he started talking about it. “Jaggu did it again. He pulled my tail and ran off. I ran behind him but …” Dhanno did not complete but his red eyes showed how angry he was. Jaggu, the fox, enjoyed teasing Dhanno. “Why do you have to get so angry every time? Every one teases you because you get angry. You should control your anger.” Bholi had tried to explain him so many times before but Dhanno never changed. Looking at Dhanno’s sad face, Bholi would try to cheer him up. “Next time Jaggu tries to touch your tail, kick him.” And both laughed out loud. Everyone knew their friendship was strong but it was soon put to test one day. As usual Bholi came back home in the evening only to find her home had been broken down. The walls were broken, all money and jewelry was gone. Bholi was devastated. 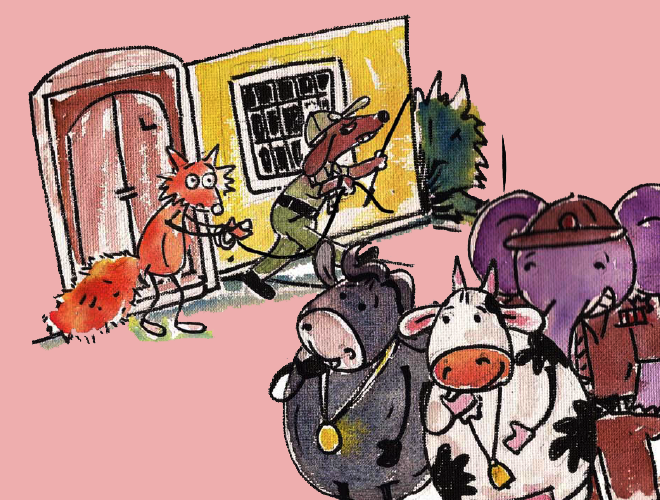 All the other animals gathered around Bholi’s house and started talking about who could have done it. The police was informed. 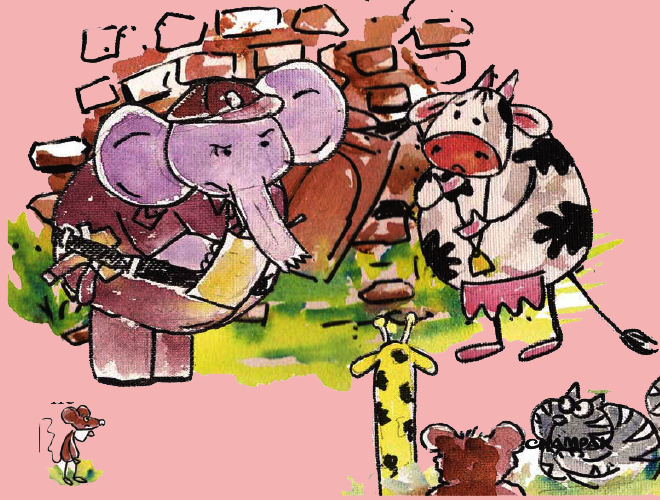 Inspector Motu, the Elephant, was on duty and came promptly to the crime scene. Everyone knew about Bholi and Dhanno’s friendship. They were surprised that Dhanno was not present. Bholi needed her friend at this time. Everyone knew! It was Dhanno’s. Bholi was taken aback. Could it be him? Before she could complete, Dhanno gave an angry look and ran off from there. Bholi looked back at Inspector Motu. “Dhanno visits me every day. It must have fallen off at that time.” Bholi tried to defend him, not believing at all that he could have done. But everyone knew Dhanno’s bad temper and thought it was him. 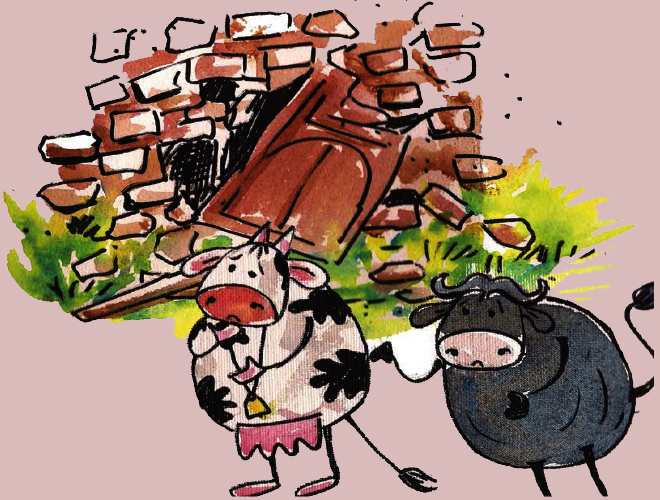 Bholi started pulling together whatever remained of the house. Other animals started helping her too. But Dhanno wasn’t seen for the rest of the day. It was late night. Bholi was sitting near her broken house. All others had left and gone back to their home. But Bholi didn’t have any left for herself. Not only had she lost her home and everything else, but it looked like she had lost her friend too. She looked at her house and started crying. I am sorry.” Bholi looked behind as she heard Dhanno. “Don’t look behind. I won’t be able to meet your eyes.” He stopped for a second only to calm himself. Dhanno waited for Bholi to say something, get angry even. But Bholi did not say anything. “Yes, I know I broke your house but … but I did not steal your money and jewellery. I swear. And I promise you I will give all my money, even my house to you” said Dhanno. “I am not angry. I am happy that you were honest with me but I hope that you have realized what your anger has done to me.” Dhanno hid his face in shame. Dhanno promised that he would. That made Bholi very happy. Suddenly Dhanno realized who the culprit was. After realizing that he had destroyed Bholi’s house, Dhanno ran away from there in shame but Jaggu was still there. Bholi and Dhanno immediately informed Inspector Motu who searched Jaggu’s house and found the stolen stuff. Jaggu was arrested at the right time. He was preparing to run away forever. “Your anger may have destroyed her home but at least by being honest, you saved her from making more loss.” Inspector Motu later told Dhanno. “Yes, as I always say, honesty pays off,” said Bholi. Everyone laughed. Dhanno and Bholi left to re-build her house.